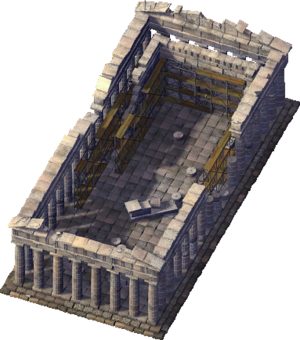 The Parthenon is a downloadable Landmark Building for SimCity 4 Rush Hour/Deluxe, released as the Plugin Pack 00D free Downloadable Content. It is a recreation of the Parthenon in Athens, Greece as it appeared in 2003. The News Ticker fluff entry created on its placement is "Parthenon Teaches #city# a Lesson in Proportion". This page was last modified on 7 February 2014, at 06:50.